INTRODUCTION: Dental laboratory technicians (DLTs) get exposed to fibrinogen dusts that are very risky dusts in terms of health. In this study, respiration complaints, pneumoconiosis frequencies and working conditions of the dental technicians in Denizli were investigated. METHODS: All of the registered DLTs working in Denizli were included in the study. A 30-item questionnaire was used to gather data about the participants and their working environments. Then, pulmonary function tests (PFTs) were carried out and standard chest X-rays were taken in order to detect how much the respiratory systems of the workers were affected. Standard chest X-rays were evaluated according to International Labour Organizations classification. Depending on the screening results, technicians who were found to have had pathologies and suspected cases were examined. "High-resolution computerized tomography (HRCT)" was taken from those who were found to have pathology in their chest X-rays and they were evaluated according to the classification of Hering et al. RESULTS: There are a total of 166 DLTs working in Denizli Province participated in the study. One hundred and forty-three (86.1%) of the participants were male, and 23 of them were female. The mean age of the participants is 33.5 ± 8.1. Average working time of the workers is 16 years. Total exposure time was calculated 36,177 h. Approximately, 56% of workers were smokers. When the working conditions were considered, it was found that 98.8% of laboratories had a ventilation system. Technicians' use of personal protective equipment is low. Participants' often or continuous use of masks, gloves, goggles, and vacuum device was found 69%, 36%, 47%, and 63% respectively while working. About 21.2% of the technicians have respiratory symptoms while 15.2% of them have eye complaints. At the analysis of PFT results, 27.7% restrictive type pulmonary disorder was determined. At the analysis of chest X-rays; 1/0 profusion sub-category was 25.5%, and the large opacity rate was 16.9%. Ten pneumoconiosis cases (6%) were diagnosed after the analysis of the HRCT results. The ratio of pneumoconiosis was found much higher among male technicians, particularly those who have been working for a long time in the profession and those working at the town hospitals and Department of metal leveling. DISCUSSION: Technicians' use of personal protective tools is not enough and ratio of smoking is rather high. Pneumoconiosis cases clearly show this exposure. It is necessary to adopt comprehensive work health and safety precautions considering the determined risk factors. In the current study, it was aimed to evaluate the working conditions of the DLTs in Denizli Province and to determine the required precautions to be taken and to investigate if their respiratory systems have been affected or not and, if any, to determine pneumoconiosis cases. Provincial Directorate of Health carried out a health screening test covering all of the registered DLTs working in dental laboratories (1 oral and dental health center, 4 town hospitals and 27 private laboratories) in Denizli between October 30, 2013 and May 29, 2014. Necessary required legal permissions and ethical committee decisions were taken prior to the study (PAU-60116787-020/9623). In the study, at first, the data about the socio-demographic properties, respiration complaints and working environments of the technicians were obtained through a 30-item questionnaire. For respiratory problems; coughs, shortness of breath and phlegm of the participants were investigated. Ventilation in the working environment, the participants' use of vacuum, masks, goggles, and gloves were also investigated. Questionnaires were conducted by face-to-face interviews with the participants. Their total exposure time was calculated using the formula "daily working time × working years in this field ×250 days." Following the questionnaire, standard chest X-rays were taken and pulmonary function tests (PFTs) were applied. These tests were performed at the hospital. A total of 13 technicians have not taken the graph (due to the leaving the jop or pregnancy). A total of 18 technicians have not applied PFTs (due to the leaving the jop or cannot cooperate to PFT). Forced expiratory volume in 1 s and FVC values over 80% and FEV 1 /FVC ≥0.7 were considered to be normal. When FEV 1 remained normal or slightly decreased, and FVC was below 80%, and FEV 1 /FVC ≥0.7, it was considered to be a restrictive disorder. Forced expiratory volume in 1 s value below 80% and FEV 1 /FVC ratio decrease was considered as an obstructive disorder. The data were analyzed using SPSS version 10.0 software (SPSS Inc. Chicago, Illinois, USA); Student's t-test, ANOVA and Chi-square tests were used. There are a total of 166 dental technicians (23 female and 143 male) that participated in the study. The great majority of the technicians (%73.5) have been working in private laboratories [Table 1]. While 66.3% of the participants were primary and secondary school graduates, 11.4% are high school, 22.3% are vocational school graduates. About 98.2% of the technicians have health insurance. Among the sections that the technicians mostly worked at are porcelain, metal leveling and acrylic leveling sections [Table 1]. Technicians were often working together in a hall. When the working areas are considered while the technicians are working at certain departments, they might as well work at more than one department. The ages of technicians that participated in the study ranged from 18 to 55 and with a mean age of 33.5 ± 8.1 [Table 2]. It was found that technicians started to work when they were 17.2 (minimum: 11 to the maximum: 38). Occupation age of onset shows significant difference, according to gender. While men started working when they were 16.6, women started when they were 20.9 (P < 0,001). There is no other dusty work history of the majority of technicians (98%). Mean total work time in the profession was found 16.0 years. Mean daily working time is 9.1 h and weekly working time is 54 h. While it is 8.6 h for women technicians, daily working an hour on average increases to 9.2 h for male technicians [Table 2]. Thirty-seven percent of the technicians work in the labs more than 10 h a day. When the total exposure time in the profession is considered according to the gender, it is seen that male technicians (37.379 h) expose to working environment more than female technicians (28.707 h)(P = 0.049). 98.8% of the working environment has a ventilation system; however, frequent or constant use rate of the ventilation is 80.2%. When the use of protective tools was considered, it was found that while work uniform was mostly used with a ratio of 98.8%; frequent or continuous use of masks, gloves and goggles is 69.7%, 36.4%, 47.3% respectively. Thirty-four percent of those using masks use paper/cloth masks. 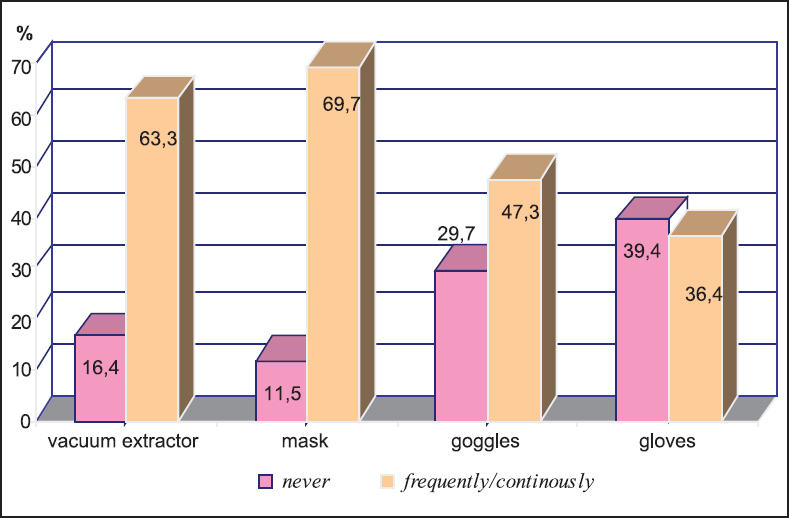 The proportion of those who do not use any of masks, gloves or goggles is rather high with a ratio of %11.5, %39.4, %29.7 in respective. The ratio of vacuum presence at the table that is worked on is 84.8%. 15.2% of the technicians do not have vacuum machine on their tables. Also, 1.2% of technicians have a vacuum machine, they never use it. The rate of those who use vacuum machine (frequently or constantly) while working is 63.3%. Among the workers, the ratio of those who receive a regular checkup is only 75.9%. The participants were also evaluated in terms of receiving vaccination for hepatitis B. The ratio of those who have never vaccinated was 5.4%, and the ratio of those, who are considered full vaccinated and that receive "three-dose-vaccine," was found 59.6%. 37.5% of the technicians are not applied disinfection before they start working on the materials such as measure and plaster model that come from the examination. The ratio of those which are disinfected is 62.5%. During the disinfection process, spray disinfectants are mostly used with a proportion of 87%. 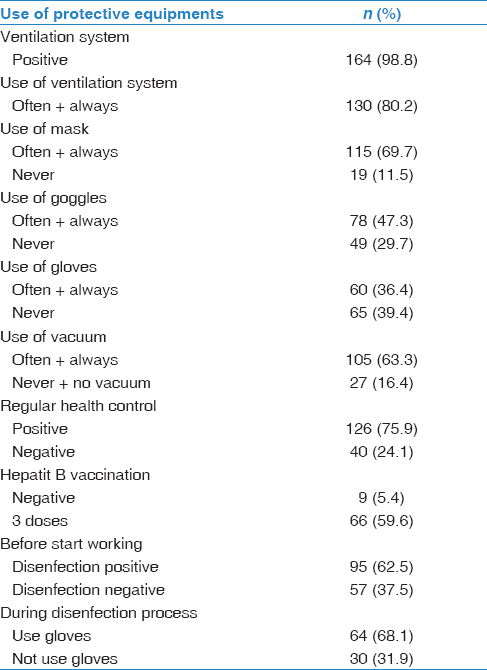 Thirty-two percent of the technicians who do not use glove during disinfection process [Table 3]. Smoking is rather common among technicians. Fifty-six percent (93 people) of the technicians have been smoking. Compared to female workers, the ratio of male workers who smoke is higher with a proportion of 59.4% (P < 0.01). Technicians smoke 14.1 ± 8.9 cigarettes a day on average. Total cigarette consumption ratio was found to be 11.5 ± 10.6 pack/year. The rate of nonsmokers is only 31.9% (53 people). Exposure to cigarette smoke at work is another significant issue that was found in the study (60%). Because a lot of dust occurs during the working time, particularly participants' eye and respiratory complaints were investigated. Among the complaints of the technicians, symptoms as having a matter in the eye, burning, stinging, and redness in the eye are the remarkable ones. 15.2% (25 people) of the technicians have eye complaints. The great majority (15 people) of these complaints were about burning and stinging. Although eye-complaints of the dental technicians are comparatively high, it is interesting that the regular use of protective goggles among the technicians is rather low with a ratio of 35.2%. However, the ratio of eye complaints decreases by 6.9% in those who use safety goggles. The rate of respiratory complaints of the technicians was determined 21.2% (35 people). While it is 19.9% among the nonsmokers, this ratio increases to 23.7% with smokers (P > 0.05). 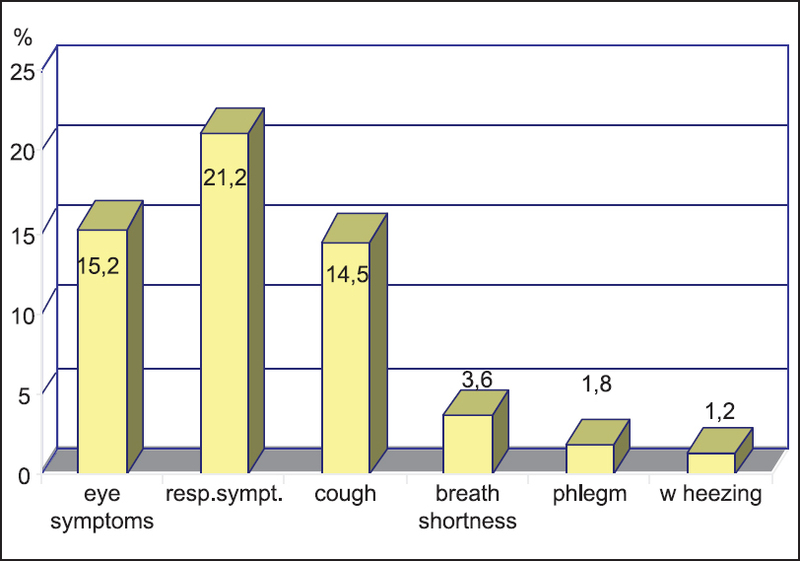 Cough and breath shortness are mostly seen symptoms among technicians. 14.5% of the technicians stated that they had complaints of cough, 3.6% had breath shortness, 1.8% had phlegm, and 1.2% had wheezing complaints [Figure 2]. Cough complaints of the technicians generally occur in the mornings and often last long. Around 60% of those with cough, symptoms stated that they had had this symptom for more than 2 years. Even more significant symptom in terms of dust exposure, the rate of breath shortness was found 3.6%. Another important finding is that 65.6% of those who had respiratory complaints stated that their respiratory symptoms tended to decrease during the time period they are away from work (e.g., weekends). The technicians were also investigated about whether they had another diseases based on their own responds. The results showed that 27.7% (46 people) of the technicians had chronicle diseases. 4.8% of them had asthma, and 3% (5 people) of the participants had chronic bronchitis. It was found that four of the technicians had dermatitis, two of them had jaundice and one of them had silicosis according to their own responds. Pulmonary function test and PA chest X-rays of the technicians were taken for screening. When PFT results were evaluated, %45.9 of 148 technicians was found to have pulmonary function disorder. Mild restrictive type respiration disorder is among the leading disorder with a ratio 27.1%. 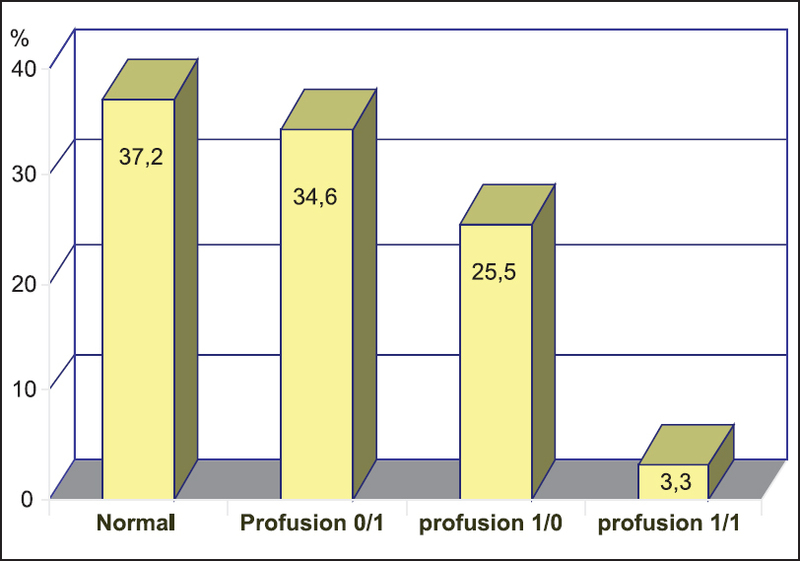 When the standard chest X-rays of the technicians were evaluated according to ILO standards; profusion subcategories were 0/1 (34.6%), 1/0 (25.5%) and 1/1 (3.3%) respectively [Figure 3]. The large opacity rate was found as 16.9%. 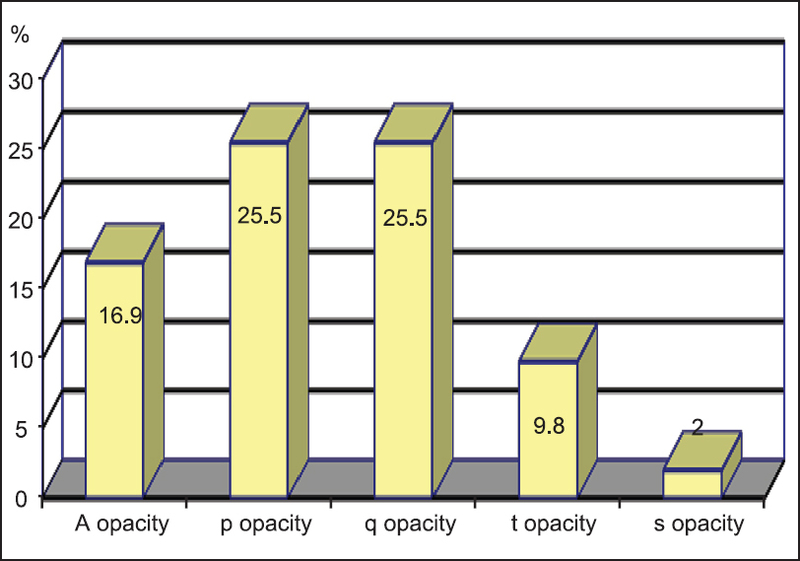 The majority of opacities were p or q and they were observed in the middle and lower zones [Figure 4]. It has also been observed one pleural thickening and two costophrenic angle obliteration. It has not observed pleural plaque. Following PFT, standard chest X-ray and physical examination, 70 technicians were called for further examination. A total of 11 technicians either did not attend or want to have a further test. HRCT was carried out by 59 technicians. Among the 59 technicians, 23 persons (40%) had rounded opacities, 7 persons (12%) had irregular opacities, 10 persons (17%) large opacities. There were 3 emphysema, 2 ground glass opacities and one pleural abnormality. Totally, 10 pneumoconiosis cases were found among them. As a result of all analysis, 22 out of 59 technicians were found normal. However, 10 technicians (6%) were diagnosed as pneumoconiosis. Furthermore, radiologic evaluations of 14 workers showed that they are highly at risk of developing pneumoconiosis. Three of the participants were diagnosed with sarcoidosis while four of them were directed for further examination for some other possible diseases. Diagnosed diseases were given in [Figure 5]. Distribution of the technicians diagnosed with pneumoconiosis according to some certain properties was given in [Table 4]. It is remarkable that all of the pneumoconiosis cases were found in male technicians and that pneumoconiosis cases were intensified among those working at the departments metal leveling and wax-modeling and among those who have been working 20 years and over and/or 30,000 h and over, and this is compatible with the general characteristics of occupational diseases. A high rate of pneumoconiosis cases in town state hospitals also takes attention. Rate of pneumoconiosis cases is higher with those who do not use masks and who work without vacuum (10%, 16% respectively). Dental technician as a profession has several occupational risks, primarily dust. During prosthesis making process various dusts occur, and if the necessary precautions are not taken, dust-related occupational diseases might develop. ,,,,, When the literature is reviewed, it is remarkable that there are several pneumoconiosis cases that have been reported. ,,,, Therefore, dental technician as a profession is included in dangerous jobs, which should be carefully monitored in terms of workers' health. The role of "working/exposure time" is important in the transformation process of health risks to disease. Occupation age of onset, daily and weekly working hours, particularly the total working time in the profession has a decisive factor in the occurrence of occupational diseases. Occupational Safety and Health Administration has remarked that dust should be kept at a certain level, and it brought restriction to working hours. Weekly working time was found as 54 h in this current study. When the legal standard weekly working time (according to labor law legislation) is considered to be 45, it is seen that technicians' working time or exposure time to dust is quite long, and therefore, workers' health risk is rather high. Dusty working environment brings about eye complaints as well. In different studies carried out in DLTs, several different rates of eye complaints of dental technicians were reported by a ratio of 5-30%. ,,, In our study, 15% eye complaints were reported. Despite this, it is remarkable that regular goggle use rate is rather low with a ratio of 35%. Another significant finding in the study is that eye complaints decrease by 7% with those using safety goggles regularly. That is, it is clearly seen that eye complaints decrease with the use of safety goggles. In different studies carried out in this field, several different rates of respiratory complaints of dental technicians were reported by a ratio of 10.3-31%. ,,,, In this current study, 21% of the technicians stated that they had respiratory problems. Furthermore, most of the respiratory complaints were related to working environments because they also declared that their respiratory symptoms tended to decrease during the time period they are away from work (e.g., at weekends). In this current study, 6% of the DLTs were diagnosed with pneumoconiosis. In fact, if those who did not come for further examination are considered, this ratio (6%) might increase a little more. Also to these ten cases, 14 technicians were detected that require monitoring in terms of pneumoconiosis. To sum up, pneumoconiosis cases as an occupational disease can often be seen in this field of profession. In this respect, it is notable that dental laboratories were defined as risky working areas by "Thoracic Society Silicosis Prevention Initiative Group" in terms of silicosis, and they suggested that sandblasting be prohibited. It is also remarkable that the ratios of pneumoconiosis cases are much higher among male workers and technicians who have been working in the profession for 30,000 h and over. Besides, 90% of the workers diagnosed with pneumoconiosis are those who have been working 10 years and over. These figures indicate that the ratio of catching pneumoconiosis is higher for those who have been working in the field for a long time. In the study carried out by the Ministry of Labour reported that 85% of the technicians diagnosed with pneumoconiosis had been working for 11 years and over. The fact that the rate of pneumoconiosis cases is much higher (10%) with those who do not use or rarely use masks indicates the significance of using personal protective equipment. Moreover, that the ratio of pneumoconiosis cases was found rather high by 16% with those who do not work with vacuum indicate the significance of local ventilation. Pneumoconiosis cases were found much more in those working in the departments of "wax-modeling and metal leveling" and it indicates the risky sections. It is also remarkable that pneumoconiosis cases were found much higher with those working in town hospitals. It is urgent that these institutional laboratories should be seriously redesigned. The results of this study show that technicians' respiratory tracts have been affected. Determined pneumoconiosis cases by a ratio of 6% clearly show this exposure. The findings also show that primary protective precautions and personal protective equipment are not used or applied efficiently. 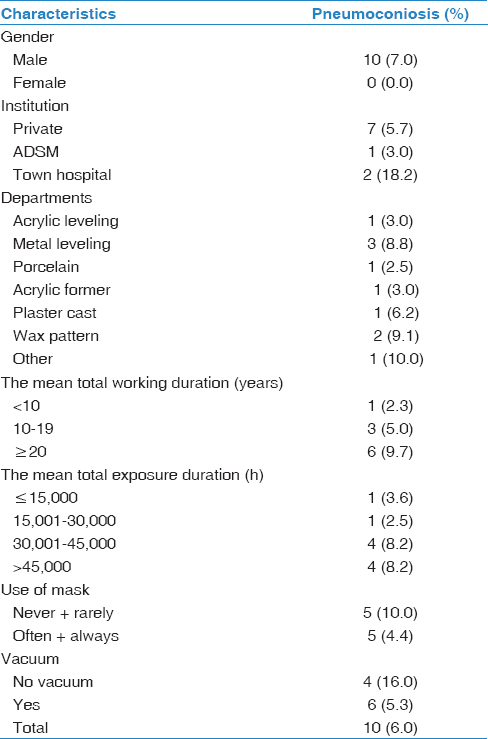 It is also remarkable that the ratio of detected pneumoconiosis cases is much higher among the workers working in the field for a long time and those working in town hospitals, particularly at the departments of metal leveling and wax-modeling and with those who do not use personal protective equipment as mask and vacuum machine. These all indicate the first areas to take action in terms of occupational health and safety. Therefore, considering all determined risk factors, it is necessary to adopt a comprehensive occupational health and safety precautions including both the employers and the employees. T.C. Ministry of Labor and Social Security: Occupational Health and Safety Workplace Hazard Classification; 26 December, 2012 Official Gazette Number: 28509. Akar CG, Aksoy G, Özmutaf NM, Akar H. An assessment of awareness and self-report about occupatıon-related health problems among dental laboratory technıcıans in Turkey. Nobel Med 2009;5:27-32. Ireland AJ, Wilson AA, Blythe L, Johnston NJ, Price R, Sandy JR. Particulate production during orthodontic production laboratory procedures. J Expo Sci Environ Epidemiol 2011;21:536-40. Leggat PA, Kedjarune U, Smith DR. Occupational health problems in modern dentistry: A review. Ind Health 2007;45:611-21. Choudat D. Occupational lung diseases among dental technicians. Tuber Lung Dis 1994;75:99-104. Choudat D, Triem S, Weill B, Vicrey C, Ameille J, Brochard P, et al. Respiratory symptoms, lung function, and pneumoconiosis among self employed dental technicians. Br J Ind Med 1993;50:443-9. The Report; Prevention of Exposure to the Dental Prosthetics Laboratory Technician Working in Pneumoconiosis and Other Occupational Disease. T.C. Ministry of Labor and Social Security. Ankara; 2013. Centers for Disease Control and Prevention (CDC). Silicosis in dental laboratory technicians - five states, 1994-2000. MMWR Morb Mortal Wkly Rep 2004;53:195-7. Karabıyık S. Occupational Exposure and Risk of Pneumoconiosis in Dental Technicians, Thesis, Ankara; 2008. Abakay A, Atilgan S, Abakay O, Atalay Y, Güven S, Yaman F, et al. Frequency of respiratory function disorders among dental laboratory technicians working under conditions of high dust concentration. Eur Rev Med Pharmacol Sci 2013;17:809-14. 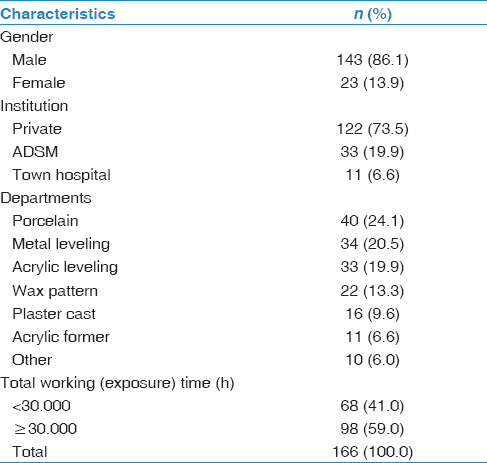 Fidan S. The Incidence of Silicosis in Dental Prosthetic Technicians. Gazi Univ. SBE PhD Thesis, Ankara; 2002. Radi S, Dalphin JC, Manzoni P, Pernet D, Leboube MP, Viel JF. 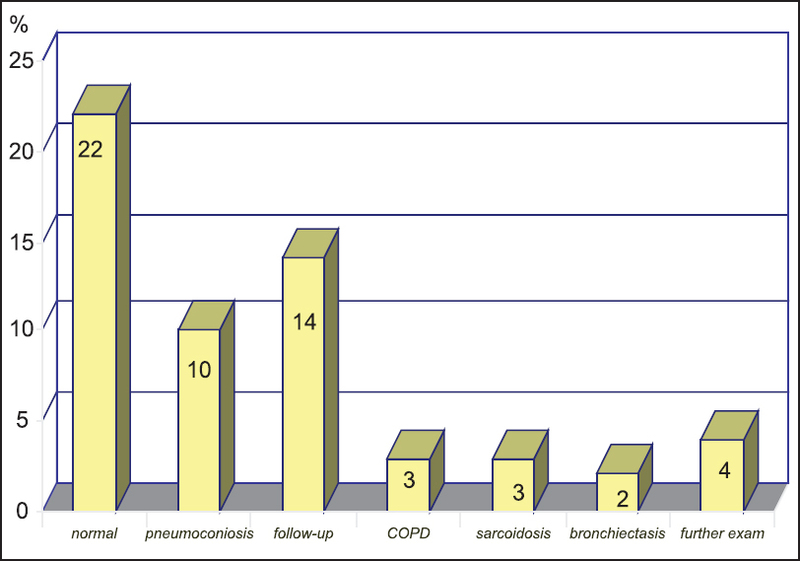 Respiratory morbidity in a population of French dental technicians. Occup Environ Med 2002;59:398-404. Jacobsen N, Pettersen AH. Self-reported occupation-related health complaints among dental laboratory technicians. Quintessence Int 1993;24:409-15. Canıvar C. Health Risks and Occupational Diseases Caused by the Relations of Production in the Dental Technician. Available from: http://www.sendika.org/2013/01. [Last accessed on 2015 Mar 9]. American Thoracic Society. Standardization of spirometry - 1987 update. Statement of the American Thoracic Society. Am Rev Respir Dis 1987;136:1285-98.
International Labour Office. Guidelines for the use of the ILO International Classification of Radıographs of Pneumoconıoses. Occupational Safety and Health Series no. 22 (rev. 2011). Geneva: International Labour Office; 2011. Hering K, Kraus T. Coding CT-classification in occupational and environmental respiratory diseases. In: Kusaka Y, Hering K, Parker J, editors. International Classification of HRCT for Occupational and Environmental Respiratory Diseases. Tokyo, Japan: Springer; 2005. p. 15-23. Ozdemir Dogan D, Ozdemir AK, Polat NT, Dal U, Gümüs C, Akkurt I. Prevalence of respiratory abnormalities and pneumoconiosis in dental laboratory technicians. Tuberk Toraks 2010;58:135-41. Rom WN, Lockey JE, Lee JS, Kimball AC, Bang KM, Leaman H, et al. Pneumoconiosis and exposures of dental laboratory technicians. Am J Public Health 1984;74:1252-7. Yurdasal B, Bozkurt Aİ, Öz İ, Gürhan E, Tanrıverdi S, Bozkurt N, et al. The investigation of occupational health status of dental technicians in Denizli, and the evaluation of effects of measures on occupational health. Turk J Public Health 2010;8:10-8. Brune D, Beltesbrekke H. Dust in dental laboratories. Part I: Types and levels in specific operations. J Prosthet Dent 1980;43:687-92. Cimrin A, Kömüs N, Karaman C, Tertemiz KC. Pneumoconiosis and work-related health complaints in Turkish dental laboratory workers. Tuberk Toraks 2009;57:282-8. The Report of Turkish Thoracic Society Silicosis Prevention Initiative Group. Available from: http://www.toraks.org.tr/sub/yayinlar/pdf/357.pdf. [Last accessed on 2015 Mar 9].